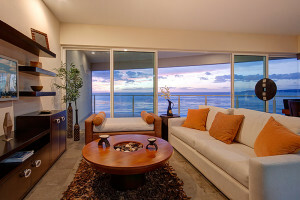 Palacio del Mar offers 2 bedroom and 3 bedroom luxury condos. Click on this link to see our Condos for Sale at Palacio del Mar. All the condominiums have excellent white water ocean views and since Palacio del Mar is a beach front community, you can walk from your luxury condo to the ocean and enjoy the rugged coastline on foot. 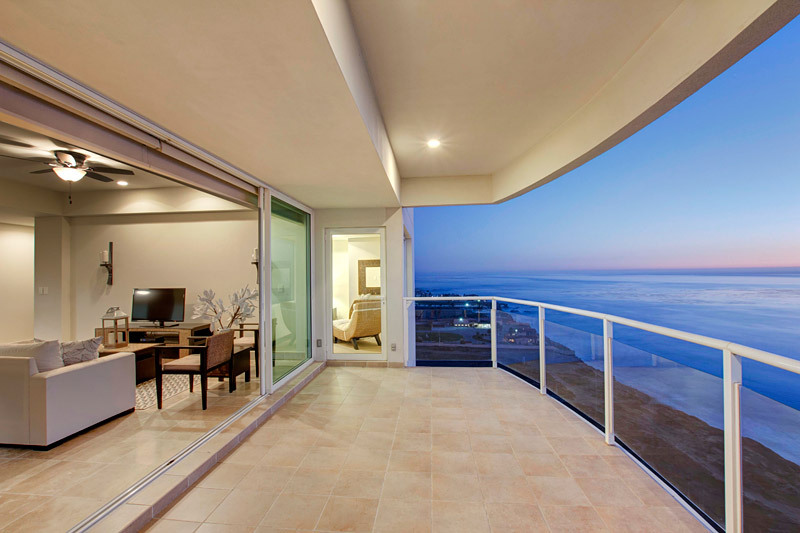 The condominiums for sale at Palacio del Mar are the most well-finished in the Rosarito area, keeping the luxury theme consistent throughout Palacio del Mar. 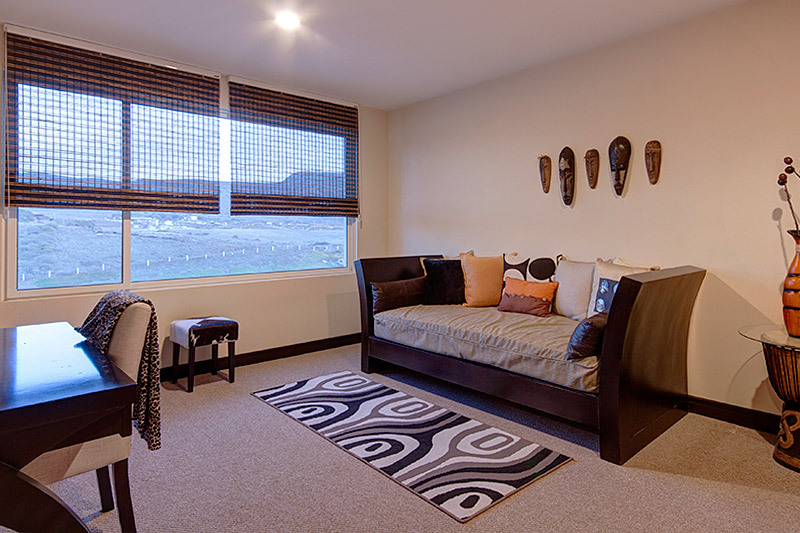 For your convenience, we offer furnished or unfurnished. The difference at Palacio del Mar and our beach front luxury condos start with the included upgrades. These included upgrades provide conformity and a certain level of luxury throughout the development, all to better protect your investment. All of the condominiums include travertine flooring, granite counter tops with tall granite backsplashes, stainless steel kitchen appliances, travertine showers with marble vanities, a full wall of glass on the ocean side with large patio sliders, and the use of propane gas for the stove, forced air heating, hot water heater, and the forced air heater. All these beach front luxury condos have an open floor plan and are large. Each floor of the building is limited to four condominiums. The 3 bedroom condos are on the south and the north end of the building and give sweeping coastline views. The two bedroom condos are in the interior of the building and have excellent ocean views from both bedrooms and the living area as well. This luxury space is simply impressive with its wall of glass patio sliders extending from the living area, dining area, and wrapping around to the master bedroom. The patio is also oversized and wraps around from the living area to the master bedroom. 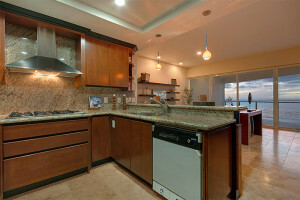 The kitchen is the hub of this condo and you have ocean views right from the sink and stove. The master bedroom is oversized with a private patio and enough space for an extra seating area and desk or vanity. The walk-in closet is the largest around, and the master bathroom is also a show piece with its double sink vanity, and very large shower with finished with travertine and views to the mesa top mountain on the east. The second and third bedrooms are also very spacious and have views to the mesa and farms. At 2020 square feet, this is one of the largest two bedroom beach front condos anywhere. The combination of the living, dining, and kitchen area is large enough for a full family and entertaining, and all of these spaces afford excellent views. One unique feature of this two bedroom model is that both bedrooms are on the ocean side of the condo giving you unobstructed ocean views, simply impressive. The kitchen is large and has a long granite bar for serving and entertaining. The master bedroom is spacious and has a walkthrough closet and direct access to the patio. The master bathroom has a double sink vanity and has enough space to add an extra piece of furniture or decoration. The shower is extra-large and includes a tiled sitting area. Click on this link to see our Condos for Sale at Palacio del Mar.